Going to CES? Building a voice interface into a new or existing product? Then come and see us at the show. XMOS far field voice processors are designed for high tech, innovative device and hardware manufacturers who are looking to improve or implement a voice interface. Join us in our private suite at The Palazzo to experience the power of voice through some of our latest commercial implementations. It’s a fantastic opportunity to see how XMOS can help with your projects. We’ll demonstrate why our far-field voice processors are optimised for edge of room and stereo devices – and we’ll also share our exciting plans for the future. 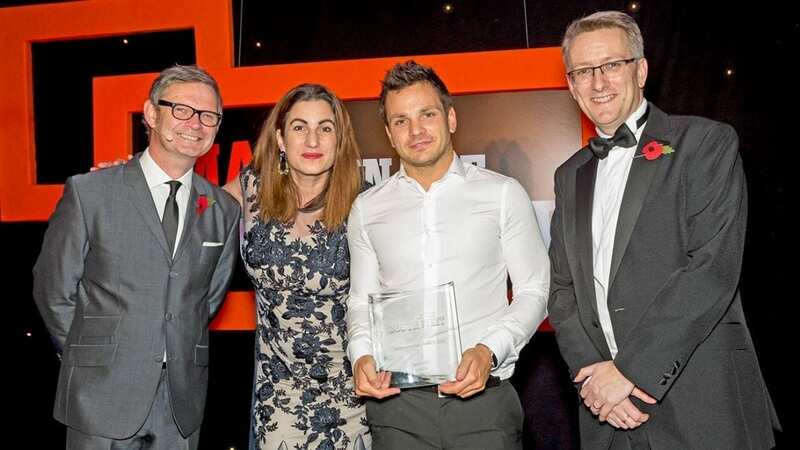 We’re thrilled and honoured to pick up the award for ‘Best Collaboration’ at Insider Media’s Made In The South West Awards 2018 – in recognition of the partnership between XMOS and Pillo Health. It’s been a pleasure work with the inspirational team at Pillo Health and support them on their ground-breaking project. This award gives wonderful recognition to the teamwork and dedication involved in voice-enabling Pillo – the 24/7 companion healthcare robot. Pillo is so much more than a secure medication dispenser. This voice-activated home health companion delivers therapy reminders, health information, and companionship to keep your care plan on track, no matter what you’re dealing with. Pillo stores your pills securely and recognizes your face and voice. Pillo knows who you are and provides you with health information and your scheduled medication dose. It’s not just about dispensing your medicines at the right time; Pillo works with you in your day-to-day life, supporting and empowering you to improve your health, wellness, and confidence so you can retain your independence. Central to Pillo, is a solution that allows voice commands to be captured across the room with pinpoint accuracy – across long distance, even when commands are spoken softly. And that’s where XMOS comes in. While designing our device, we were looking for the best solution to improve the voice capture accuracy to give our users a great experience. We tested the XMOS voice processor against other solutions on the market, and it outperformed them all for clarity, accuracy, distance, and direction. As we moved into development, the XMOS team were on hand whenever we needed them, to help us resolve technical hurdles and secure the best possible performance outcomes. The voice capture element of our design is critical to the success of Pillo, and that’s something XMOS understood from the start. A great partner and collaborator. We’re thrilled to have played a part in bringing Pillo to life and excited about commercial launch. The trials have shown the extraordinary potential the product offers to transform the lives of people across the globe. And it’s the result of an innovative, dedicated team. They have proved what can be achieved with a voice interface – and it’s just the start. 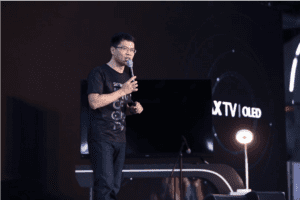 Chinese TV manufacturer Skyworth has unveiled an ‘always-on AI TV’ at its new product strategy event. 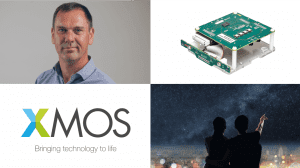 Skyworth has also joined forces with voice and audio processors specialist XMOS to develop the AI voice chip for its TVs. 2018 marks Skyworth’s 30th anniversary. A leading brand in China’s colour-TV industry, Skyworth is taking a bold step forward in the market. At their 2018 New Product Strategy event, the runaway success across of all the product launches on the day was Skyworth’s always-on AI TV. Yu Jianwei, China Marketing Headquarters Executive Vice General manager and Marketing Director at Skyworth showcased the new TV and controlled it solely by voice. He gave voice commands to switch the TV on and asked it to adjust the table lamp – successfully. Finally, in a display of great showmanship, he used a voice command to light up Guangzhou’s landmark Canton Tower. In keeping with their mantra that “Technical Innovation Makes Products Simpler to Use,” Skyworth’s always-on AI TV will ‘wake-up’ in response to a voice command and respond to what’s asked of it – whether that’s adjusting the volume or answering a general question. Skyworth has transformed from a marketing driven company one into one that’s ‘Driven by Technology’ – something that shines through in what their new AI TV has to offer. 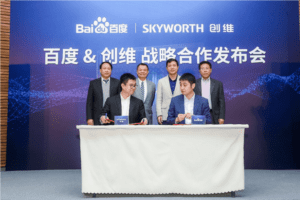 In March this year, Skyworth entered into a strategic partnership with Baidu. The integration of Baidu’s DuerOS and Coocaa System is powerful: the Coocaa System provides an optimized media resource library, while DuerOS transforms the TV into an intelligent display that provides users with more accurate search content and an elevated user experience. 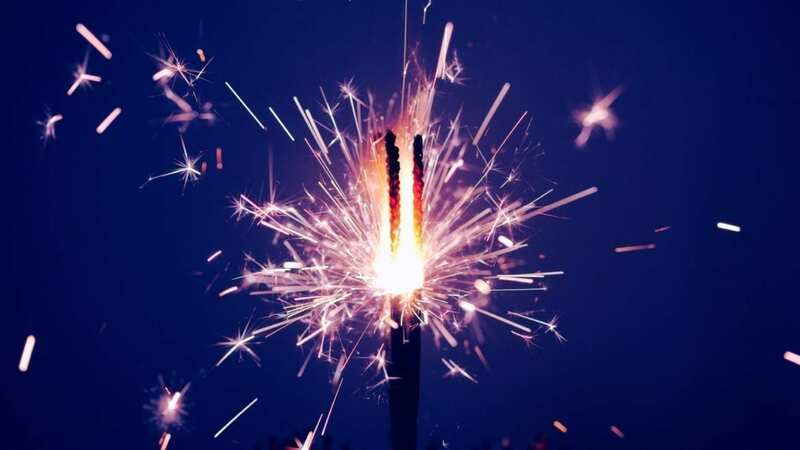 As well as upgrading its content and data-processing technologies, Skyworth has joined forces with XMOS – a world-leader in voice and audio processors – to develop the AI voice chip and remove the requirement for a remote control. Together they’ve created an immersive voice-interactive experience. The AI TV voice chip is based on XMOS VocalFusion XVF3500 voice processor, with a compact four-microphone linear array to enhance voice capture range and accuracy. Together, XMOS and Skyworth have developed a solution that enables Skyworth’s TV to deliver 180° all-dimensional sound-source identification from up to 5 meters – which means instant wake-up from across the room using only your voice. The XVF3500 voice processor also supports de-reverberation and noise suppression, enabling the Skyworth TV to ‘hear’ and accurately capture the user’s voice commands, no matter what volume the TV is playing at or how noisy the surrounding environment. The strong blend of XMOS and Skyworth’s integrated voice-interface and Baidu’s information and service eco-system, gives Skyworth’s consumers another high-quality, high-tech product that brings the power of voice to life. XMOS stands at the interface between voice processing, biometrics and artificial intelligence. Today our unique silicon architecture and highly differentiated software delivers class-leading far-field voice capture for consumer electronics, and we’re building for a more natural human machine interface tomorrow. See www.xmos.com for more information. Skyworth was established in 1988, headquartered in Shenzhen High-tech Industrial Park known as innovative Silicon Valley, with over 35,000 employees. Being rooted in China and determined to go global, Skyworth is a large-scale high-tech group company mainly engaged in research, development and manufacturing of such products as consumer electronics, display devices, digital set-top-box, security monitor, network communication, semi-conductor, refrigerator and washing machine, 3C digital, LED illumination, and has been listed in the main board of Hongkong stock market in 2000 (HK00751). Through 26 years of development, Skyworth now ranks among the top ten global color TV brands. 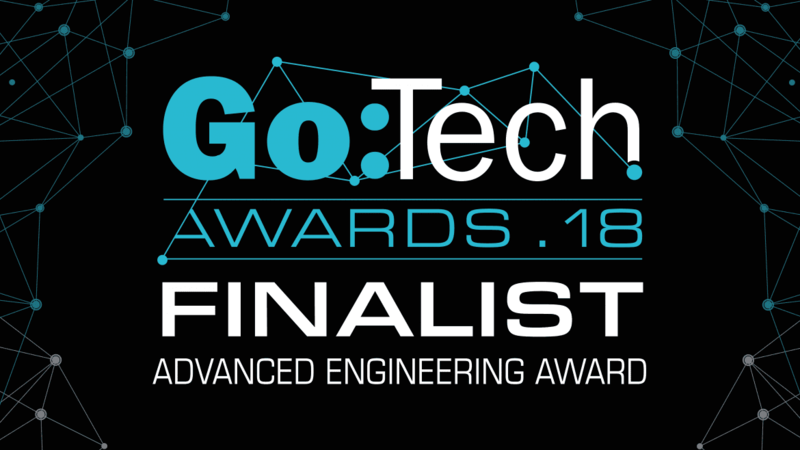 XMOS, leading supplier of voice and audio solutions, is excited to be shortlisted for the Advanced Engineering award at the Go:Tech Awards 2018. These Awards celebrate businesses and entrepreneurs leading the way in technology and innovation across the UK, across small, medium and large businesses – and we’re honoured to take our place among the finalists for 2018. We look forward to meeting everyone at the awards night on the 22th November where we’ll discover who takes home the award. Is The TV Remote Control Soon To Become Extinct? “It might seem strange at the moment, but it won’t be long before remotes are retired and voice takes over,” predicts Mark Lippett, CEO of embedded voice and audio company XMOS. Click the link above to read the full article by Anna Tobin in Forbes. On-device AI and push notifications could put voice assistants at the ‘intelligent edge’. “At its most powerful, voice can deliver a user experience like a ‘digital twin’, delivering ‘just in time, personalized, relevant content,“ says says Mark Lippett, CEO at XMOS. Click the link above to read the full article by Jamie Carter in TechRadar. 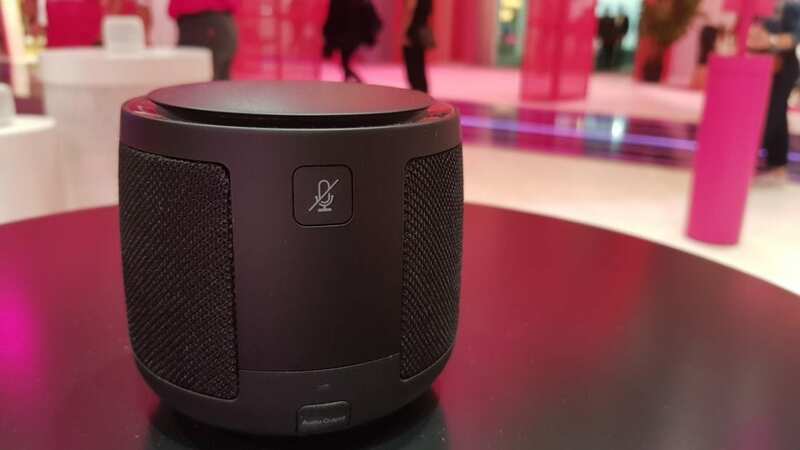 XMOS, leading supplier of voice and audio solutions, are proud to be part of the team that helped to create Magenta – Deutsche Telekom’s smart speaker, which delivers superior 360 degree far field voice control and sophisticated audio in a small, attractive and portable design. Using XMOS’s high-performance silicon and voice algorithms, experts at the Hearing, Speech and Audio Technology branch at Fraunhofer’s Institute for Digital Media Technology (IDMT) in Oldenburg, Germany, were able to refine and combine microphone and loudspeaker technologies to create a robust voice control system that allows the user to listen to music at the same time as using voice command controls. Launched at this year’s IFA in Berlin, the Magenta Smart Speaker unites all the algorithms necessary for maximum quality and accurate audio reproduction. Combined with intelligent algorithms for speech capture – integrated on XMOS voice processor – the teams collaborated to optimise the interaction between speakers and microphones for voice control in real world, noisy environments. Using the Magenta intelligent personal assistant, voice control can be used to operate connected devices in the home such as TV and Deutsche Telekom’s smart home applications without the need for a remote control. The personal assistant can also be used to make telephone calls with excellent audio quality. Users of Amazon’s cloud-based Alexa Voice Service can also access a large number of apps with Deutsche Telekom’s smart speaker. The new voice-controlled assistant conforms to the highest data security requirements. Data processing takes place exclusively within the European Union and complies with Deutsche Telekom’s high data protection standards. XMOS is a leading supplier of voice and audio solutions to the consumer electronics market. Unique silicon architecture and highly differentiated software positions XMOS at the interface between voice processing, biometrics and artificial intelligence. For more information, please visit www.xmos.com, or email press@xmos.com. The objective of the Fraunhofer IDMT in Oldenburg is to transpose scientific findings related to hearing perception into technological applications. Its applied research priorities are the enhancement of sound and speech intelligibility, personalized audio reproduction and acoustic speech and event detection. Application fields include consumer electronics, transport, the automotive sector, production, safety, telecommunications and healthcare. For more information, please visit www.idmt.fraunhofer.de/hsa. Voice-enabled technologies will transform the health and happiness of the elderly. 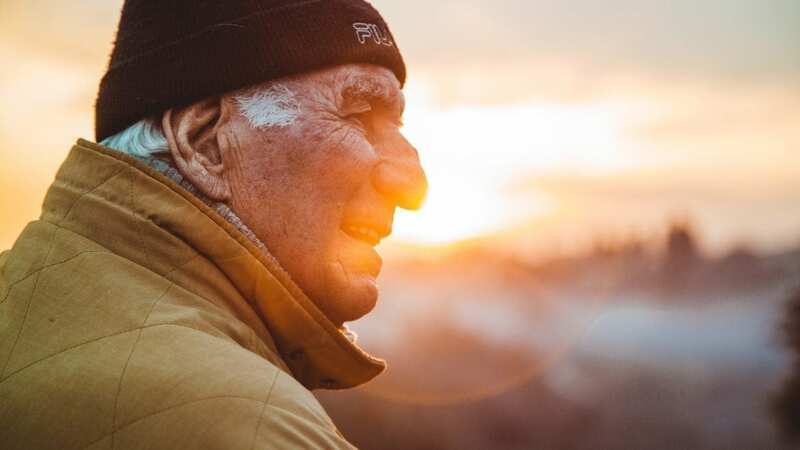 The UN predicts a 56% rise in the number of people aged 60 years or over, taking us from over 900 million in 2015 to nearly 1.5 billion in 2030.The world’s population is changing. Our demographic is aging. And this could well be the defining issue of our time. An aging population creates a burden on health systems and individual households. Family members, clinicians, and assisted care providers will need a new generation of technology platforms to help them stay informed, coordinated, and most importantly, connected. The social care system is facing a mountain of challenges and it can’t cope with a sustained upswing in the number of senior people and adults living with chronic illnesses. Whether living at home or in an assisted facility, help may come from an unexpected source – technology. Speech recognition and voice-enabled devices make technology accessible to all. There’s no need to tap a keyboard or figure out how to work the remote control, you simply talk to the device from across the room. A voice-controlled device can empower a formerly ‘dis-empowered’ user. It can ease pressure on caregivers, becoming a companion and digital assistant. Of course it’s not a replacement for human interaction, but rather a meaningful addition. How can voice-enabled assistants make a difference? Voice-enabled assistants such as Amazon’s Alexa, Google’s Assistant, Apple’s Siri, and Microsoft’s Cortana are at the forefront of society’s screenless future. Thanks to rapid advancements in voice technology and natural language processing (NLP), these virtual assistants are far better equipped to understand human speech and respond accurately (and in real-time). These virtual-assistants can perform all sorts of tasks – including playing music on demand, calling friends or prompting you to take your medication at a certain time. This can make a big difference to those living with a chronic illness, anyone who has limited mobility, and the elderly. It can make tasks easier and create a sense of companionship. More importantly, it helps people regain control. From simple actions such as lighting the room and adjusting the temperature, to things that are critical to our wellbeing, such as controlling access to our home and the calling for emergency assistance when needed. The team at Pillohealth have come up with a ground-breaking, in-home 24/7 companion robot – Pillo – which combines voice control, facial recognition and artificial intelligence to provide personalised digital healthcare. The technology can also provide 24-hour care and companionship, entertainment on the go, reminders of when the patient needs to eat, sleep or move and the ability for the person to live independently. The device acts as a secure pill dispenser, offers video check-ins with caregivers, can quickly and reliably identify valuable healthcare insights and can send data to healthcare professionals. But it offers much more than that to the user. They don’t need to learn how to use Pillo, they can just talk to it – and the companion robot is on hand to tune into their favourite radio station radio, answer a question, manage their calendar and give them handy reminders. Happiness comes when the ‘assistant’ becomes something more akin to ‘companion’. A study by US company Brookdale Senior Living, explores technologies that can help the older generation stay independent for longer. A team set out to determine whether reciting Shakespeare with a robot could increase engagement and lessen symptoms of depression. A two-foot tall robot called Nao recited the first 12 lines of Shakespeare’s Sonnet 18, “Shall I compare thee to a summer’s day?” and then prompted seniors to recite the last two lines. Those who interacted with Nao experienced significant decreases in depression and significant increases in engagement over time. Showing the tangible capability of voice-enabled assistants to be more than just a virtual caregiver, but at times a companion who is available 24/7. Over time, advancements in artificial intelligence will improve voice-enabled assistants. Learning more about the user with each interaction, they will move from reactive responses to a more relevant, engaging conversation. They will become an integral part of the consumer ecosystem, seamlessly integrating across all devices and platforms to become a natural, digital companion. Crucially, if technology is controlled by voice, it becomes accessible to everyone. There’s no need to learn how to use it, you just talk to it. A number of studies have shown that talking makes us feel happier, so it’s easy to see how voice enabled technology could transform life for the elderly in ways that are both practical and emotional. And given our aging demographic, this feels like a very good thing.